Generic, slasher-like title aside, this is an effectively creepy and suspenseful low-key chiller from Italy, taking as its inspiration the Fussa Valley Forest’s annual Krampus festival, associated with the legend of the Devil whisking away bad children.. The disappearance of four year old Tommi sparks a massive search and a media circus, with his troubled Dad arrested on suspicion of murder and his Mum attempting suicide. Five years later, Tommi is returned to his broken family with the assurance of a “100% accurate” DNA test – but the boy is distant, has no memory and conveys violent behavioural traits; town crazy Dmitri warns that “he’s the Devil” while Tommi’s grandfather voices concern to his priest. 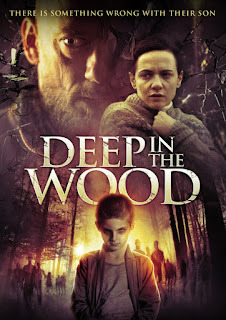 Carefully paced and centered around credibly flawed adult characters, this follows a line of stand-out modern horrors that follow often unsympathetic protagonists with family lives already fractured (by infidelity, alcohol dependence) before the “horror” unfolds. It has a vivid sense of a community torn apart by superstition, prejudice and suppressed past events, while smartly weaving strong themes (fear of our own children, mental illness, the enduring impact of grief) into its compelling mystery. Only fleetingly falling back on overt scares, it’s a disquieting experience sustained by powerful performances and a suitably bleak, wintry backdrop.